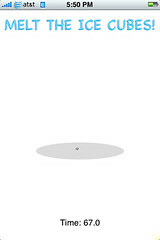 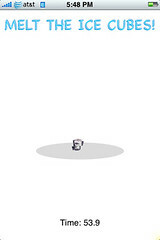 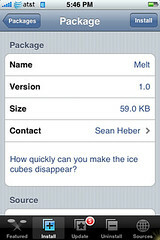 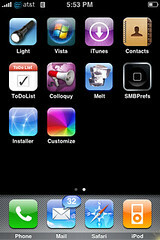 Developer’s description of app: How quickly can you make the ice cubes disappear? 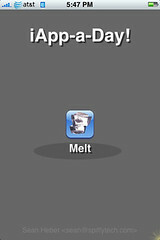 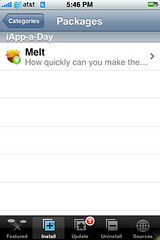 The app for November 3rd is “Melt.” As soon as you start the app a timer at the bottom of the screen starts and on the screen are two ice cubes. 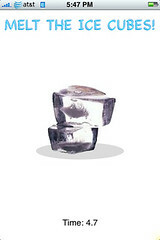 As you rub your finger over the ice cubes they start to melt. 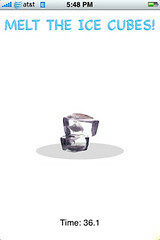 If you stopping moving your finger the ice cubes stop melting. 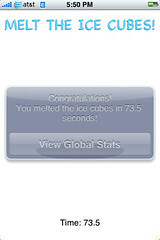 Once the ice cubes are melted it gives you the time it took you to melt the ice cubes and then the option to view the global status. 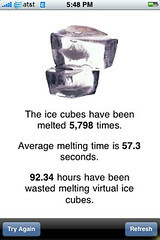 In the global status you will see how many times the ices cubes have been melted, the average melting time and how many hours have been “wasted” melting virtual ice cubes!